Trips to the beach are great for lazing around and sunbathing, and we’re always up for a bit of R&R when we’re on our holidays. But beaches aren’t just good for lying prostrate beneath the clear blue sky; you might want to get some swimming in as well! So we’re going to focus on beaches that are as good for splashing and swimming as they are for sunning and soothing. Whale Bay is located on the east coast of the North Island of New Zealand in the Northland region. A forty-minute drive from Whangarei, Whale Bay is a beautiful white-sand beach fringed with gorgeous native bush. Whale Bay is only accessible by walking the short, well-maintained gravel path from the free car park, which takes around 15 minutes. The track down to the beach can be a little steep at times, but it’s a comfortable walk for all fitness levels and is well worth the effort. There are a few steps at the bottom of the path, which take you on to the beach. Whale Bay is a great beach for swimming and snorkelling with its calm and crystal clear waters. Despite its beauty, you might find that you’re one of only a handful of visitors; another reason why it’s one of our favourite beaches in New Zealand. Good to Know: Free parking. Basic toilets available at the beach. No food or drink facilities so bring a picnic. No direct road access. A little further north from Whale Bay but still on the East Coast is the township of Russell, just across the water from Paihia. 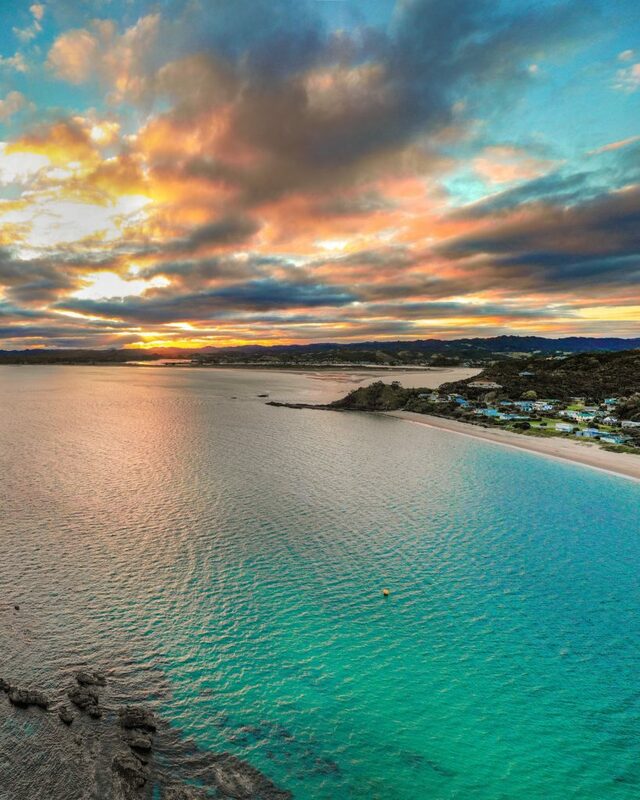 It’s a beautiful area that’s perfect for getting away from it all, and Russell’s main beach, Kororareka Bay is another great place for swimming and snorkelling. But sometimes, popular swimming beaches can get a little crowded, so we recommend walking over the hill to the lesser known Long Beach. You’ll find the paved, off-road path to Long Beach in the town of Russell, at the intersection of York Street and Wellington Street, and the scenic walk will take you about 20 minutes. Once at Long Beach, you’ll find a large golden sand shoreline mostly used by locals with great views out to the Cape Brett Peninsula. It’s a wonderful location for sunners and swimmers, with safe and sheltered all-tide swimming. Good to know: No direct road access. Across the rocks at the northern end of the beach is Donkey Bay, one of New Zealand’s few naturist beaches. Hot Water Beach sits at the northeast corner of the Coromandel Peninsula. It’s a beautiful sandy beach in a part of the country known for its rugged coastline and huge rock formations. You’ll find Hot Water Beach on the east coast between Cathedral Cove and the popular Tairua beach. Hot Water Beach is great because the water is… you guessed it – hot! Well, not all the water: the sea is the same temperature it usually is, but if you take a few steps back from the waves at low tide, you can dig down to the thermal water bubbling just beneath the surface of the sand and make your very own natural hot tub! Good to know: Hot Water Beach has some pretty dangerous rip tides, so take heed of the signs designating the safe swimming areas. Keep an eye on the waves when relaxing in your hot tub to avoid being drenched by the ‘suddenly very cold’ breaking waves. On the north coast of the South Island, you’ll find the gorgeous golden sands of Kaiteriteri Beach. A world famous beach resort that borders the Tasman Sea, Kaiteriteri is one of New Zealand’s most popular tourist destinations. To find the beach, just head north from Nelson, via Richmond on Highway 60 towards Riwaka, and pick up signs from there. Kaiteriteri Beach is great for swimming, kayaking, water-skiing and walking (if you fancy a break from the water sports!) It’s a perfect jump off point for exploring the Abel Tasman National Park, which you can do by boat if you like. This is also New Zealand’s sunniest region; so don’t forget your sun cream! Good to know: Great camping facilities are available, along with boating tours and water taxi. Kaiteriteri can get quite busy in January. A great place to watch seals! On the north side of the Abel Tasman National Park you’ll find Tata Beach. This is a classic long sandy beach with calm turquoise waters, and is arguably the most beautiful beach in the Golden Bay area. 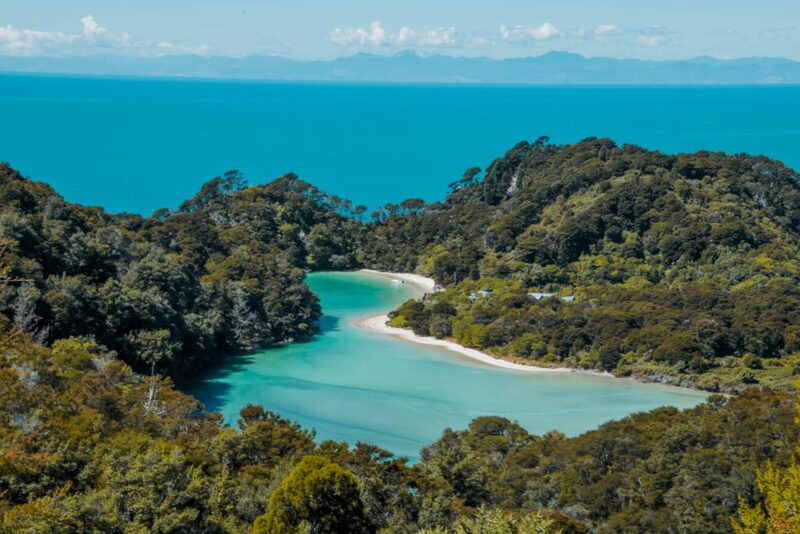 It is located near to the town of Takaka and is one of the few beaches in the area which doesn’t involve a bumpy ride along rough gravel tracks. Pick up highway 60 at Richmond (just south of Nelson) and head north. Once you get over the top of the hill, you’ll soon arrive at Takaka, when you can take short 20-minute drive along a paved road to Tata Beach. The crystal clear waters at Tata Beach make it popular with swimmers, but you’ll also find water sports including paddleboards, kayaking and boating available. We recommend a boat tour around the nearby islands and a trip to the adjacent secluded beach (only accessible from the water). Good to know: Ample parking and well-maintained toilets. Very family friendly. 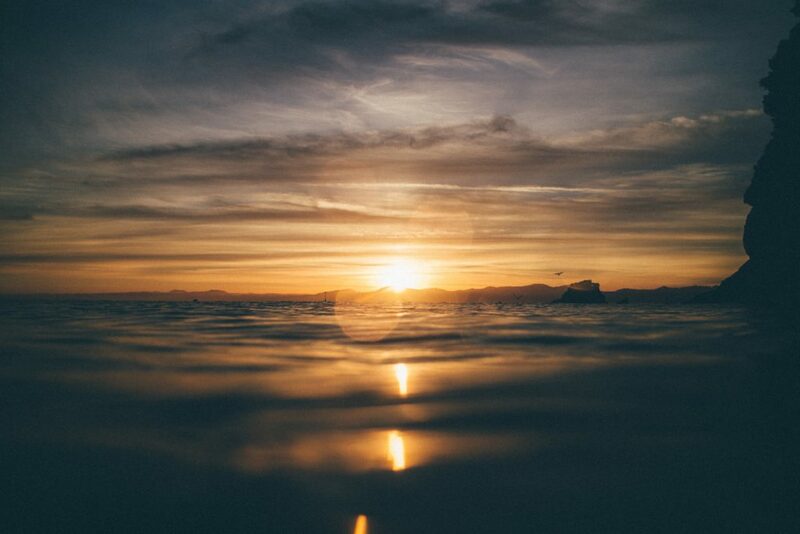 Water is generally calmest in the morning. – Are New Zealand Beaches Warm? The climate in New Zealand is temperate, and the coastline sees the most stable temperatures in the country, which means great summer temperatures, and in some places pretty good winter ones as well! The average summer temp in New Zealand is around the mid-low 20s. In the winter the temperature drops a little, but can still be as high as 15° on the North Island and 12° on the South. Average water temperatures are about 18-20°, which isn’t bad at all when you consider that UK waters usually peak at 18°. You’ll find the water a little warmer than this in the summer, especially in the North Island, but in the winter water temperatures on the south coast of the South Island will drop by around 10°. Of course, one option is to invest in a wetsuit and then you’re good all year round! – Are New Zealand Beaches Safe? The sea can be dangerous no matter where you are in the world and New Zealand is no different. Drowning is the third most common form of accidental death in NZ so it pays to be careful. The most common risks on New Zealand beaches are strong rip tides, large breaking waves and sudden drop offs. But as long as you limit swimming to beaches that are patrolled, seek advice from lifeguards before you jump in and make sure you swim between the flags, you’ll be absolutely fine. – Do New Zealand Beaches Have Sharks? New Zealand lies in the South Pacific Ocean, which does contain sharks, and they can be present along the coastline. Many of these sharks are small and harmless (such as dogfish), but larger species including Great White, Hammer Head, Bronze Whaler and Makos can also be present. That said, shark attacks are extremely rare (averaging one every two years for the entire country, and resulting in only 12 fatalities since records began) so keep it in perspective and don’t let it put you off a dip in the ocean. The best thing to do is consult lifeguards about any recent sightings, and then get out there and enjoy your swim. New Zealand has such a huge range of things to do; it’s easy to forget that it also has some of the most beautiful beaches in the world! From the suntrap turquoise waters of the North Island, to the beach resorts of the South, and the rugged beauty of the west coast, there’s something here for every kind of beach lover. So when you’re out there, make sure you to dip your toe in: the water’s lovely!